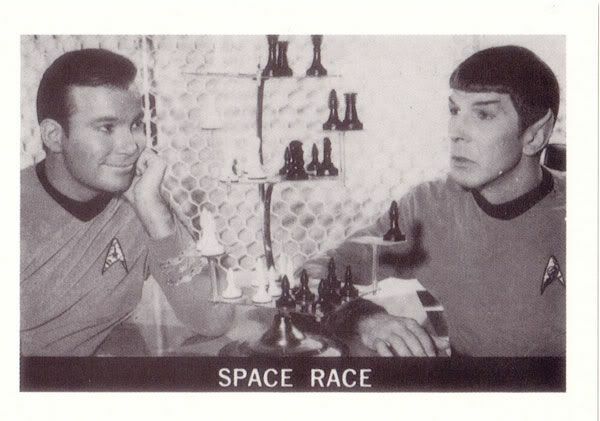 The Rundown: Back in 1967, Leaf made plans to produce a Star Trek card set based on the show. 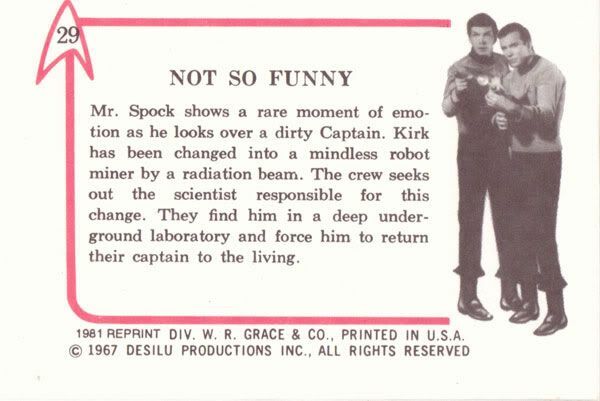 The 72 card set was released as a test market item and was quickly pulled from shelves and never received full distribution. This makes the Leaf card set one of the most sought after non-sport card sets ever produced. Most folks will choose only a card or 2 to own of their favorite characters since putting together a full set can cost ALOT of money. Another option is the fantatstic reprint set from 1981. That's what I picked up. What makes this set REALLY cool is the fact that Leaf used alot of behind the scenes shots for the card fronts. 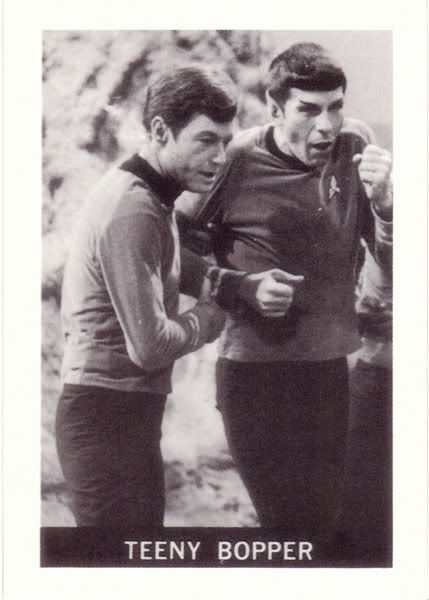 You get to see shots of Spock with his collar zipped down, a shot of Kirk holding hands with his evil self from "The Enemy Within" that clearly shows the face of the stand-in, and lots of the cast goofing off. 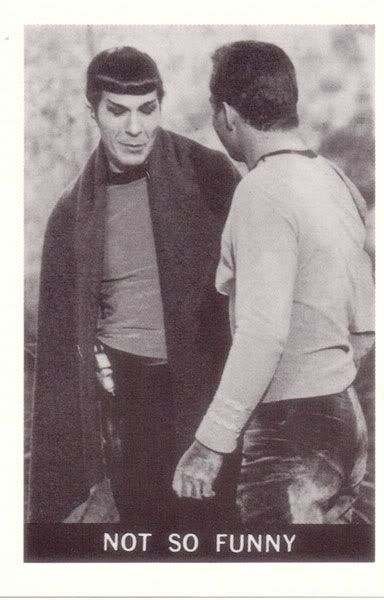 Behind the scenes shots of the cast are in themselve cool, but the icing on the cake is that the writers at Leaf tried to explain the shots as if they really occur on a Star Trek adventure! And that's the reason for this spotlight... I've chosen 4 of my favorite ridiculous Leaf cards to showcase here (don't worry...there's plenty more in the set if you search it out yourself). Number 4: Card 29 "Not So Funny"
Number 3: Card 18 "Space Race"
That's a smug look of confidence from "Earth Man". 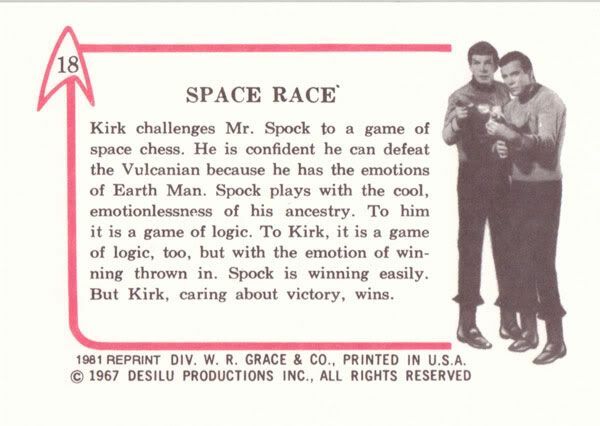 And remember kids, if you want to beat a Vulcan with a superior mental capacity all you have to do is throw "the emotion of winning" in. Oh, and "caring about victory" helps too. 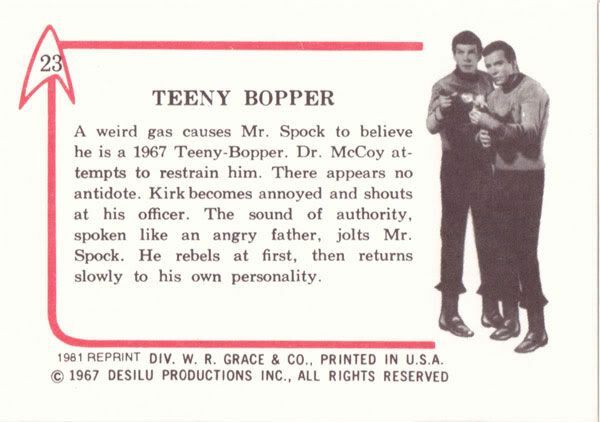 Number 2: Card 23 "Teeny Bopper"
Hey look! 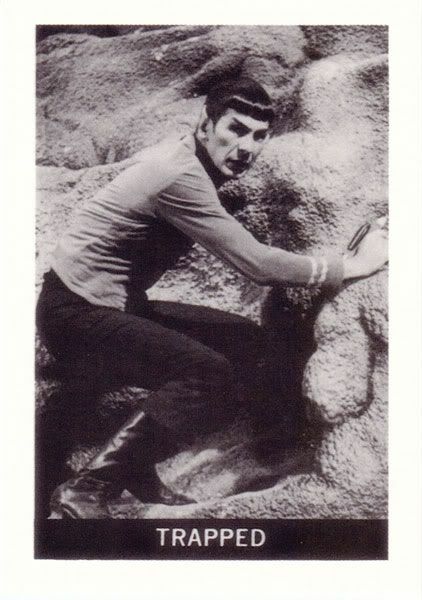 Nimoy's joking around in front of the camera!....oh wait, what's that Leaf? Something else is really going on? What might that be? Lesson learned? 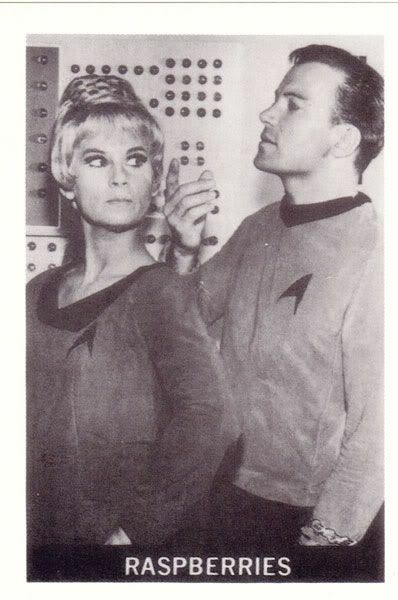 Don't ever act like a 1967 Teeny-Bopper around Captain Kirk. He will become annoyed and shout at you. 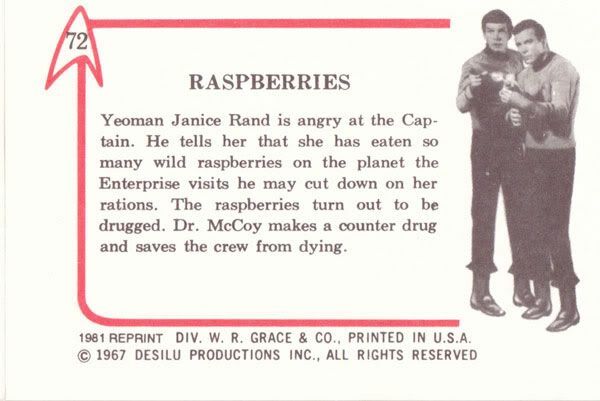 And the number 1, best card in the entire set is: Card 72 "Raspberries"
So, yeah, this card set is awesome. I highly recommend picking up the reprint set. It's pretty cheap, and it's a real hoot.